Two and a half years ago, Elaine Bartlett stood on the steps of the state Capitol in Albany and told a crowd how she had spent the better part of the past 20 years in prison. She had received the sentence not for murder, or armed robbery, but for a relatively low-level, first-time drug offense. As Bartlett talked, the crowd murmured sympathetically, because all of them had a family member doing hard time under New York's tough Rockefeller drug law. Recently, with the governor's commutation of Bartlett's sentence they were starting to feel that maybe, just maybe, the tide was beginning to turn in their favor and against incarceration. And perhaps it was, but just slightly. New York posted the third largest drop in its population out of all the states in the U.S., according to a report by the U.S. Bureau of Justice Statistics released this summer. The state had 3.8 percent fewer prisoners at the end of 2001 than a year previously. In part, these numbers are the result of a falling crime rate. But crime has been decreasing in New York for nearly a decade, and, until a few years ago, the prison population continued to rise. In large part, the falling prison population is a product of political and social changes in how we view drug offenses and addiction and in our attitudes on criminal justice. The good news about the declining prison population must be qualified both by the fact that New York still has among the harshest drug laws n the nation (for further details on proposed changes to the Rockefeller laws, see article by Maia Szalavitz) and by the fact that there are still an awful lot of New Yorkers behind bars. Here and across the country, there is a major debate: Does placing large numbers of people in jail for long periods of time effectively lower crime? And, if it does, what is the cost of doing so, both to individuals and to the poor urban neighborhoods where most prisoners come from? Every week, hundreds of men and women enter the New York state prison system. Hundreds more are released; given bus tickets from the rural upstate facilities in which they have served time, and sent back to New York City. At the same time, busloads of low-income New Yorkers leave midtown Manhattan and head upstate on the long trip that takes them for a brief visit to their incarcerated spouses, parents, siblings, lovers and children in prisons with names like Attica, Dannemora, Wende and Bedford Hills. "I ask that question: God, have you forsaken me?" says Nazimova Varick, whose son Anthony is an inmate at Greenhaven prison, serving a sentence of 25 years to life for drug dealing. "I'm serving this time with my son. He's been stolen from me and I've been stolen from him, by way of the judicial system." America relies far more on mass incarceration than other Western democracies. Over the last 30 years, supporters of the American approach have argued that crime epidemics can best be controlled by punishment rather than through soc ial programs. In his book "Thinking About Crime," sociologist James Q. Wilson wrote, "Punishment is not an unworthy objective for the criminal justice system of a free and liberal society to pursue. The evidence supports (though cannot conclusively prove) the view that deterrence and incapacitation work." From the 1970s until very recently, few policy makers challenged Wilson and those who share his beliefs. Now, however, increasing numbers of sociologists and criminologists are again arguing that the reduction in crime has more to do with economic indicators like unemployment than with the threat of jail time. Many suggest that mass incarceration simply shunts explosive social problems into the future, without actually addressing the causes of crime. For years, New York politicians were apparently convinced by the arguments of Wilson and others like him. It remains to be seen what effect the challenges to the orthodoxy of the past decades will have on leaders in Albany. Thirty years ago, just before the Rockefeller drug laws were enacted in the Empire State, 12,500 New Yorkers were serving prison sentences. Today, although the state's prison population has fallen somewhat since its peak in the mid-1990s, and although the crime rate is the lowest it has been since John Kennedy was president, more than 64,000 New Yorkers are prisoners. Since 1981 alone, according to estimates by the advocacy group the New York Correctional Association, the state has added 46,000 beds to its prison system, spending somewhere in excess of $4.5 billion on construction costs. It now costs over $2 billion per year to run the prison system. Between 1988 and 1998, the state's annual corrections budget rose by $761 million. During this same decade spending on the state and city public university systems declined by $615 million per year. New York has not been alone. Under pressure from an increasingly crime-weary population in the 1980s and early 1990s, one state after another passed legislation increasing the penalties for a wide array of crimes. 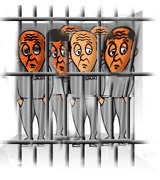 In states such as California, the tough-on-crime movement eventually generated such draconian, catch-all laws as Three Strikes And You're Out that gave life sentences to three-time offenders regardless of whether the third strike was for murder or for stealing merchandise from a store. Federally, in the 1980s Congress enacted tough mandatory sentences for drug-related crimes, and in the 1990s passed legislation dramatically reducing the scope of parole and providing generous grants to states that enacted laws such as "Truth in Sentencing." These measures mandated that felons serve at least 85 percent of their sentences, thus largely eradicating the practice of reducing sentences for prisoners who behave well while in prison, and drastically curtailing parole. Such laws ultimately had the effect of increasing the length of time inmates served behind bars. While New York did not embrace laws like Three Strikes, the Rockefeller laws and the overall political climate created similar results. Where in the 1960s and early 1970s, politicians talked about "rehabilitation" and waging war on poverty, in the 1980s and 1990s, they talked about punishment and waging war on crime and drugs. Increasingly, more and longer prison sentences came to be demanded as the norm. At the same time, city politicians were also beginning to push what became known as a quality of life agenda, leading to far more people being arrested for misdemeanors, acquiring a criminal record and so being more vulnerable to being sent to prison should they subsequently be arrested again. The policing changes that have focused on the tracking down of ever-pettier offenders have jacked up the city's misdemeanor arrests from 150,000 in 1987, at the height of the crack epidemic, to a quarter of a million today. Deals cut in Albany contributed to the rising prison population. Politically, Mario Cuomo, who served as governor from 1983 to 1995, made a bargain on crime: In exchange for the legislature's tacit acceptance of his anti-death penalty stance, Cuomo presided over an unprecedented expansion of the prison system, one funded, in large part, through a complex series of bond acts. Governor George Pataki, while endorsing the death penalty, continued the prison boom. With many upstate communities floundering economically in the wake of agricultural and industrial collapses, building prisons proved to be a godsend to many towns. Their political representatives fought hard for prison money to be sent their way. In many respects, like the public works programs of earlier decades, prisons became a convenient way to use government dollars to hire on the rural unemployed. But it resulted in a chasm between prison inmates and prison guards. Increasingly, New York's prison population is made up of poor African Americans and Latinos from the state's large cities, especially New York. They are guarded largely by impoverished white, rural, correctional staff. Nationally, one in 10 black men in their 20s are behind bars; in some neighborhoods of New York City, the numbers of young men either in prison or on parole approach 30 percent. Since they are housed in prisons upstate, and so counted in the Census as being residents there, this skews Census data, subtracting population from the city neighborhoods in which the bulk of the prisoners originated and adding it to upstate communities. This could have an impact on the allocation of congressional seats and state funds. When prisoners return to New York City, after their sentences are completed, they return to a city with rising unemployment and to a social services net stretched increasingly thin. Not surprisingly, even for those who manage to enroll in job-training programs such as the Lower East Side's Center for Economic Opportunities, employment prospects are grim: Mindy Tarlow , director of the Center for Economic Opportunities, estimates that her program only places 65 percent of its clients, and of these, fewer than half retain their jobs for more than six months. Add in the fact that in the 1990s Congress passed legislation banning those convicted of a drug-crime from living in public housing, or from ever receiving government-funded student aid, and the chances of an ex-con making a successful transition back into the city's legit economy become increasingly slim. For those who don't find work, the chances of being sent back to prison are high: 40 percent of parolees end up back behind bars within three years. Release, back to crime and return to prison has become a vicious circle for tens of thousands of New Yorkers. The prison boom has also created a problem for the future. An increasing number of women, many with young children, are being sent to prison. The 1997 Federal Adoption and Safe Families Act allows parents to be charged with "abandonment" if they don't have contact with their children for six months, or if the children have been in foster care for 15 of the past 22 months - even if the parent is in prison. This has created a whole category of mainly city-based parents who lack all legal rights in respect to their children. Albion, the state's largest women's prison, is some 400 miles from New York City, making it extremely hard for children to visit imprisoned mothers on anything approaching a regular basis. Research indicates these prison-orphans are far more likely to get into trouble than their peers whose parents remain at home. The law may thus be providing the prison system with its next generation of residents. Sasha Abramsky is author of "Hard Time Blues: How Politics Built A Prison Nation."